AlgaBerry™ is an edible blue-green alga, (scientific name: Nostoc), which can form the spherical colony with diameter ranging from one fifty of an inch to one and half inch. It is a source of vitamin A, calcium, iron protein, and polysaccharides. 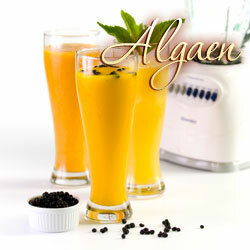 AlgaBerry™ was used as herbal medicine, dietary supplement and food delicacy in Far East for over 1500 years. Because AlgaBerry™ grows in the wild, without roots stems, or leaves, and floats on water, the Chinese compared it to the “immortals” that were said to travel to the world at will. The nutritional value of AlgaBerry™ was recorded in traditional Chinese medical literature. Four hundred years ago, for instance, AlgaBerry™, along with 1892 other traditional Chinese medicines, was listed and described in the “Ben-Cao-Gang-Mu” (also known as “General Outlines and Divisions of Herbal Medicine”, or “Compendium of Materia Medica”) by Shi-Zhen Li (1517-1596?) of the Ming Dynasty. AlgaBerry™ has also been the common dietary supplement for the indigenous populations of Japan, Thailand, Philippines, Peru, Fiji, Ecuador, Java, Mongolia, Siberia, Mexico, as well as in Nordic countries for centuries.